Synopsis (from the publisher): A year ago, fresh out of Harvard Law School, Mike Ford landed his dream job at the Davies Group, Washington's most powerful consulting firm. Now, he's staring down the barrel of a gun, pursued by two of the world's most dangerous men. To get out, he'll have to do all the things he thought he'd never do again: lie, cheat, steal-and this time, maybe even kill. Mike grew up in a world of small-stakes con men, learning lessons at his father's knee. His hard-won success in college and law school was his ticket out. 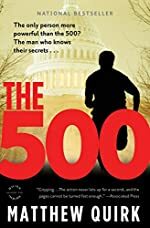 As the Davies Group's rising star, he rubs shoulders with "The 500," the elite men and women who really run Washington — and the world. But peddling influence, he soon learns, is familiar work: even with a pedigree, a con is still a con.